The UNEVOC Centre in Magdeburg, Germany, in collaboration with the Federal Ministry for Economic Development and Cooperation (BMZ), organized an International Experts Meeting on “TVET, Digitalization, Work 4.0 – Consequences for Learning and Working in the Informal Sector”. The International Experts Meeting provided a platform for an effective knowledge exchange on recent problems as well as potential challenges for Technical and Vocational Education and Training (TVET) in the context of digitalization and emerging features of the new world of work. The aim was to identify approaches in the working context of international cooperation that could contribute to the positive development of the TVET sector – specifically addressing the informal economy in partner countries. Shyamal Majumdar, Head of UNESCO-UNEVOC, gave a welcome address along with the newly appointed Head of Division for Education at BMZ, Ms. Ina von Frantzius. He also delivered a keynote speech on “Skills for a connected world- addressed within UNESCO’s TVET strategy” and took part in a panel discussion on “Major trends in changing work caused by digitalization - Specific TVET approaches and interventions for target groups in the informal economy in the digital era”, together with Christine Hofman (ILO), Carina Lange (GIZ Togo), Samantha Hung (ADB), and Tobias Muehler (GIZ Ghana). Around 34 International Experts from BMZ, HRD Korea, BIBB, ILO, GIZ, ADB, DIE, and representatives from GIZ country offices worldwide attended the meeting. 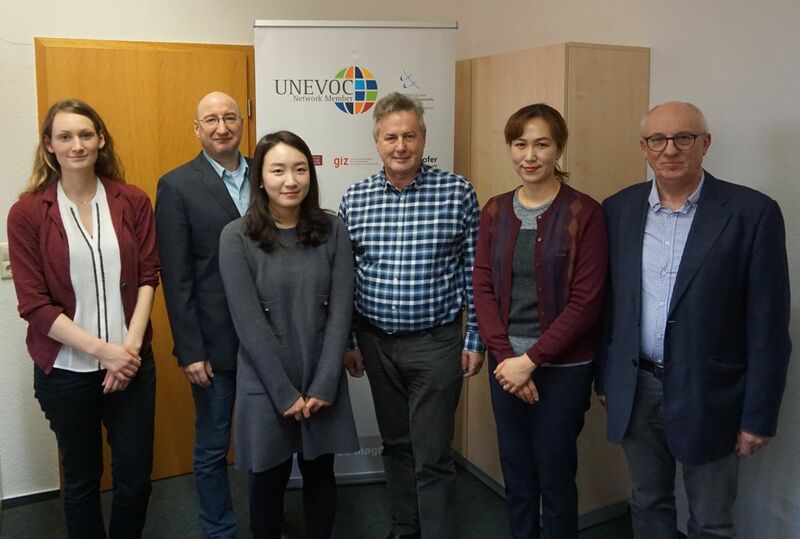 The Human Capacity Development (HCD) Unit in Technical Vocational Education and Training (TVET) of GIZ Magdeberg took the opportunity to arrange a bilateral meeting with another UNEVOC Centre, the Human Resources Development Services of Republic of Korea (HRD Korea), to discuss options for joint activities in 2019. HRD Korea and GIZ Magdeburg intend to strengthen collaboration and knowledge sharing among development cooperation stakeholders to promote sustainable development in TVET and reach a wider target group, especially in ASEAN countries. Suggestions ranged from training for TVET providers in ASEAN countries, a joint workshop with other UNEVOC Centres, possibly on the topic of harnessing digital solutions in TVET, as well as a capacity development workshop in Germany for TVET stakeholders from the Republic of Korea.